Stair design can set the scene in any home, and for those homes along the coast, the stairs can be as bright and airy as the beaches outside. Whether a coastal home is a permanent residence, second home, or rental property, custom stairs can take a beach residence to a new level. This week, we explore current trends in coastal stairs design. Boasting modern appeal and clean lines, these unique design options each offer a conversation-worthy appeal. The coast has its own unique ambiance, and this often shows through in coastal interior design, including staircases. We are proud to offer extensive capabilities and limitless customization options, and many of our coastal customers select unique treads to set their custom stairs apart. With their sleek and modern feel, marble treads are increasingly popular among coastal homes. Marble lends a sense of luxury balanced with modern, clean lines, and we expect this trend to continue in coming years. A second popular tread option in coastal stair design is tile. Tile can be customized to fit any home’s style, and its ease of cleaning creates a perfect fit for life at the sandy beach. For those seeking a highly creative coastal tread, our smooth stone designs are an excellent choice. Like the stones that wash ashore, smooth stone enhancements reflect the natural beauty of the beach itself. Like any other design aspect, handrails in coastal homes vary greatly. One popular railing material choice among our coastal customers is glass. 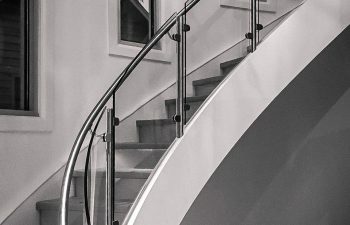 Glass handrail brings a contemporary look to any home, with the added benefit of unobstructed views throughout the space. Especially among homes with ocean views, glass is the perfect handrail material to open up the living area. Another modern railing choice, stainless steel, establishes a sleek design with an alluring appeal. This minimalistic approach to modern handrail design allows the beauty of the coastal home to speak for itself. In recent years, we have also seen a trend toward the use of custom ornamental metal within coastal handrail design. For a truly custom look, our team of expert craftsmen can design and hand-forge a wrought iron handrail system to capture the home’s unique style. With limitless design options available, our creative and talented team will guide you through the design process and provide turnkey construction and installation services. We are proud to deliver the most innovative custom coastal staircases while providing a seamless ordering process for each customer we serve. We have partnered with general contractors from coast to coast to enhance their homes through custom stairs design, and we are committed to flawless execution throughout all phases, from design through delivery. Visit our luxury residential photo gallery for additional details and pictures on our exquisite projects. From inspiration to installation our team is committed to designing and building the highest quality custom staircases. Our reputation speaks for itself and client satisfaction is our highest priority. 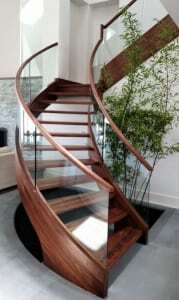 Contact us today to discuss your next coastal stairs design project.